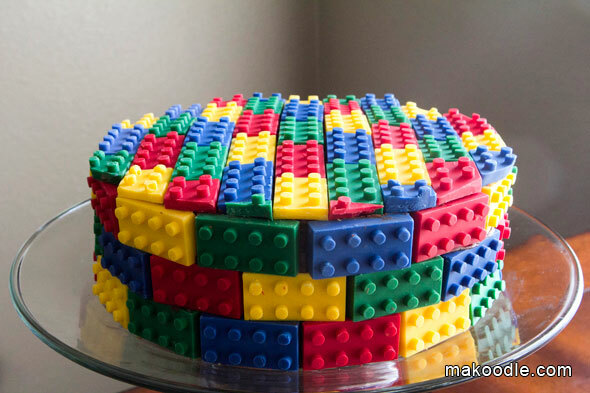 When I was preparing for my son’s birthday party, I searched and searched for great Lego cake ideas. I didn’t find many ideas that I loved and/or in my cake decorating skill set. 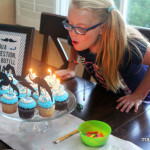 Most of the cool Lego cake ideas I came across were done by professional cake decorators. 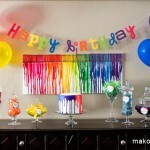 I didn’t want all of our party budget to go to cake decorating, so I got creative. I found this great lego brick mold on Amazon. 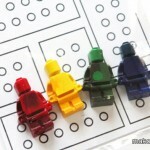 I used red, yellow, green, and blue candy melts to make edible Lego bricks to decorate the cake. The blue candy melts weren’t the color of blue I wanted, so I used some blue oil based food coloring to get them to the perfect color. 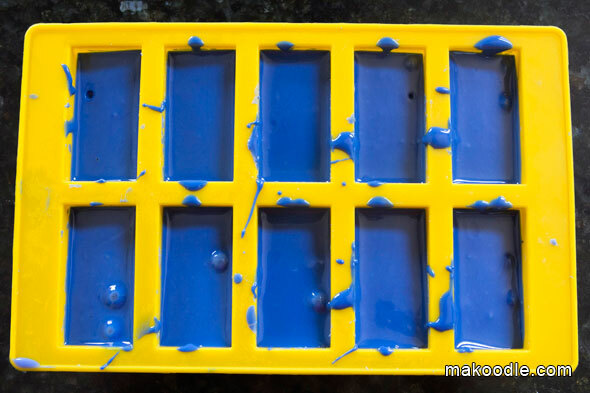 I placed four candy melt disks in each brick compartment, then put the mold on a cookie sheet in the oven for several minutes at 225 degrees to melt. When the candy melts were melted, I pulled the mold out of the oven. One trick I figured out when making the molds was to tap the mold on the counter to force the air bubbles to come up to the surface and pop. I put the mold into the freezer until the bricks were setup, then popped them out of the molds. 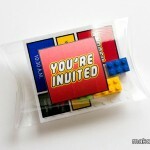 The Lego bricks were created several days before the party so there was less to worry about on the day of the party. My son loves chocolate cake. I turned to my favorite “homemade from the box” chocolate cake recipe that I originally shared here. 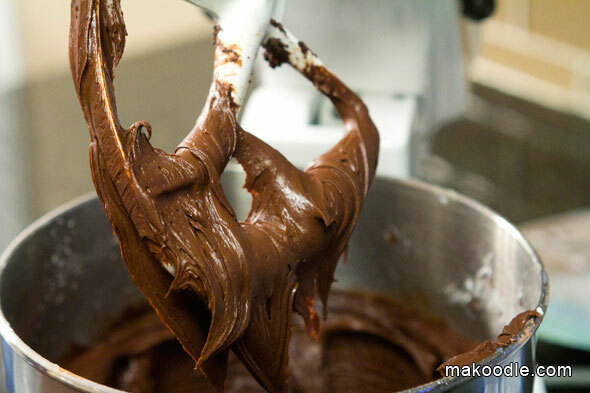 Preheat your oven to 350 degrees F. In a large bowl or stand mixer, combine the cake mix, eggs, oil, water, sour cream, pudding, and chocolate chips. Mix until well combined. The batter will be thick. Place batter in two or three 9-inch round cake pans and cook for 30-35 minutes. Melt butter and stir in cocoa. Alternate powdered sugar and milk. Beat to spreading consistency. If needed, add a small amount of additional milk. Stir in vanilla. Makes about 2 cups of frosting. After the cake was frosted, I placed the candy Lego bricks around the perimeter of the cake. On the top of the cake, I cut and shaved down the edges of the candy bricks using a knife to create the rounded edges. I was really happy with how the cake turned out and my son loved it. 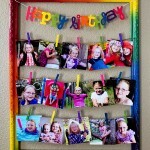 Brilliant idea using the candy melts. Hi, I Love the Lego cake that you made and wanted to make it for my son’s 4th birthday party, but had a couple questions if you don’t mind. 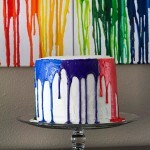 Did you have any problems with the Lego bricks sticking to the cake frosting? 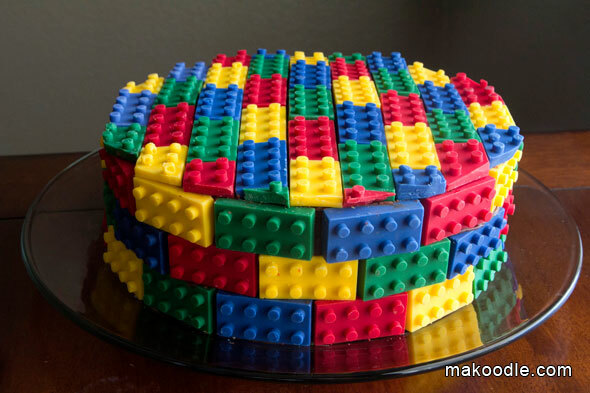 And were you able to cut the cake through the Lego bricks??? Thanks! No, the lego bricks stuck to the frosting without any issues. I just started at the bottom layering the bricks on and worked my way to the top. I think the bottom layers helped support the top layers. Yes, I was able to cut through the bricks. Good luck!